Palm Sunday of the Lord's Passion - My Catholic Life! One way to understand a book, or to watch a movie, is to begin at the end. To read, or watch, backwards allows every character and plot twist to be interpreted in light of their conclusions. Working backwards removes much of the drama and tension from a story, of course, but it also makes the story perfectly intelligible. No slow unwinding of the plot, no “whodunit,” no surprise around the corner, and no unexpected deaths. Skipping to the end makes the entire narrative clear, with prior knowledge infusing prior meaning into the story as it unfolds. The Gospels of Matthew, Mark, Luke, and John are essentially Passion narratives with extended introductions. There is plenty of evidence that the end of Christ’s life, particularly his last seventy-two hours, were well remembered by His disciples, the events being repeated in great detail until they were ultimately written down. The Evangelists eventually supplemented these often repeated Passion narratives with further details about Christ’s life which had occurred long before Holy Week. These prior narratives are often inconsistent across the Gospels, emphasize diverse aspects of Christ’s life, and omit or add details in a seemingly arbitrary manner. What is very consistent, however, are the Passion narratives. Their vivid details are, without doubt, the heart and soul of the story of Jesus Christ. 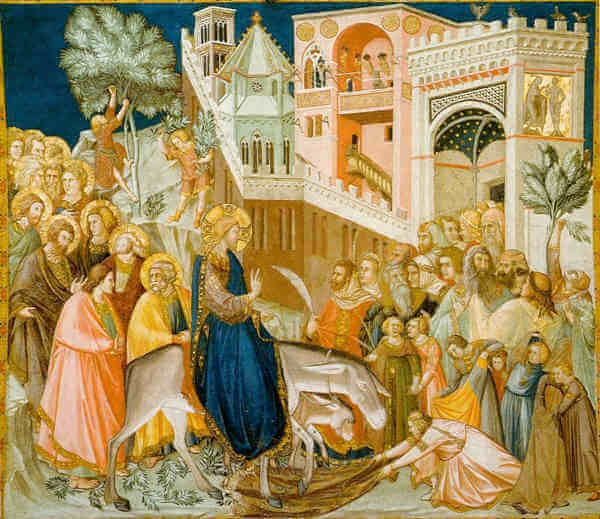 On Palm Sunday we begin with the end. We read our way backwards. It is not possible for any Christian to think of Jesus Christ divorced from how His earthly life ended. Even the earliest Christian writings were composed from a post-Resurrection perspective. The “real” Jesus of history did not have miracles placed on Him like ornaments on a Christmas tree. His miracles were not later adornments hung on His human frame to lend Him credibility. The “real” Jesus is not the simple carpenter lurking in the shadows behind the Christ of Faith created by later generations. There are scant biblical references to Jesus’ occupation as a carpenter, or to His simple and humble existence in a provincial town. There is a massive amount of biblical evidence, on the contrary, that Jesus suffered, died, and rose from the dead. And this biblical evidence is buttressed by an abundance of postbiblical testimony and the universal witness of an army of Apostles, saints, and martyrs. All of this means that the “real” Jesus is the Christ of faith! The “real” Jesus did suffer, die, and rise from the dead! The “real” Jesus is not found in the subtext of the Gospels—He is found in the text of the Gospels! And those texts are indisputably ancient. 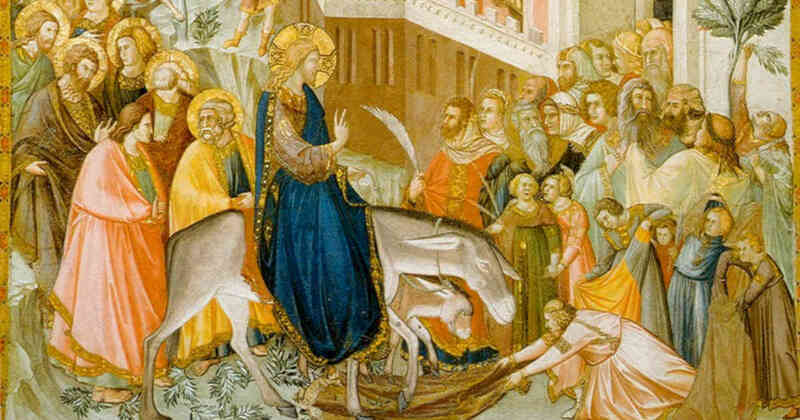 In other words, the narrative read at Mass on Palm Sunday is the oldest, truest, and most well-remembered portion of one of the most fully preserved and extraordinary documents from the ancient world—the New Testament. Our faith is rooted in history, a miraculous history. The Passion of Jesus Christ is not a parable, analogy, or metaphor. It is not a story meant to teach us a lesson apart from its facts. It is not a morality play whose actors mean to teach a lesson. The Passion of Christ is theologically significant because it is historically true. If it were not historically true it would have no significance beyond its power to inspire as a story. But every culture already has myths to inspire its people, or at least mythical figures whose superhuman qualities model greatness. The story of Christ is so much more. It is the true story of a God-man who was betrayed by a friend, suffered calumny from His enemies, was publicly humiliated, made to carry the instrument of His own execution, and then was left to die, naked on a rough-hewn tree. This story is not sad by analogy to another story. It is sad in and of itself. This is the story we hear every Palm Sunday. This is how a great man’s life came to an end. It is also the story of how the Son of God conquered death and opened the gates of heaven to all who not only believe in Him but who belong to Him through the Catholic Church. Lord of the Passion, You suffered calumny and humiliation, You bore the Cross and did not complain. Intercede before Your heavenly Father that we may bear whatever crosses we must with fortitude. With Your grace, Lord, we can emulate You. Without Your grace, we are no better than Godless pagans, in search of frivolous signs to lend meaning to life.